The remote Greek island of Tilos is transitioning into one of the Mediterranean’s first green energy islands after years of struggles with power outages, disappointed tourists, and high energy costs. During summer, 2018, a hybrid power plant consisting of a single wind turbine, a photovoltaic solar panel station, and battery storage system is expected to start meeting the daily electricity needs of between 250 and 300 households. An effort is underway to turn the tiny Dodecanese island, 78 km (48 miles) from Rhodes, into a green energy island, drawing upon an 11 million euros ($12.9 million) grant from the European Commission. It’s part of the EU’s Horizon 2020 research and innovation initiative, which emphasizes science, industrial leadership, and tackling societal challenges. The goal is to ensure Europe produces world-class science, removes barriers to innovation, and makes it easier for the public and private sectors to work together in delivering innovation. The idea of transforming Tilos was first proposed in 2009 by the late mayor, Tassos Aliferis, an environmentalist who banned hunting and promoted eco-tourism. The current mayor, Maria Kamma, continues to champion his green legacy, hoping it will improve residents’ quality of life and give Tilos a more secure future. 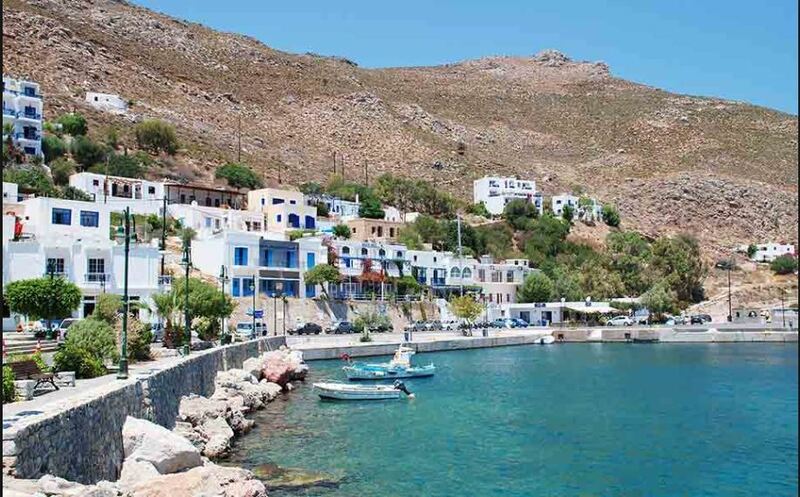 Last year, 23,000 tourists visited Tilos, drawn to the island’s picturesque villages and abundant wildlife. As energy demand rises from June through September, the overloaded grid frequently collapses, said Zisimos Mantas, chief business development officer of Eunice Energy Group, the Greek company managing the project. Tilos has depended on dirty diesel power from the island of Kos, 69 km away. Connected to 2 other islands via an underwater cable, the diesel electricity production is heavily polluting and quite costly. Greece’s smallest, most remote islands pay 20 times more for energy than the mainland and rely significantly on state subsidies, according to Dimitris Zafirakis, coordinator of the Tilos project and a lecturer in energy at Piraeus University of Applied Sciences. The final insult is the system’s unreliability, especially when summer tourists arrive with high expectations. Hoteliers experience failed appliances, rotting food, and unhappy guests. The frequent power cuts sometimes last as long as 12 hours. The Tilos microgrid will use solar and wind power to generate enough electricity for the 550 residents who live on Tilos year-round and thousands of tourists who visit every summer. Green energy will help the island become a circular economy – one that produces little waste or pollution – and protect Tilos’ rich biodiversity, with more than 150 species of birds and almost 350 plant varieties. In essence, the system will generate and store enough power to supply about three-quarters of the island’s annual demand. 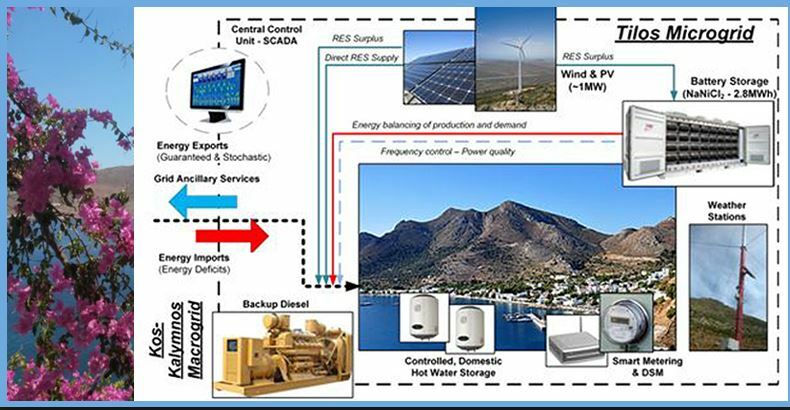 The innovative elements of the smart microgrid developed in Tilos are built to operate both autonomously and in connection to the island of Kos. It will become a largely self-sufficient energy hub capable of exporting clean electricity to neighboring small islands. Storage is key for an island like Tilos where electricity demand changes throughout the year, and solar and wind sources are intermittent. “Instead of importing oil-based electricity from Kos, we want to export renewable energy to Kos,” Zafirakis said. The Tilos project provides a blueprint for other remote islands that depend on the mainland for electricity and are looking to become self-sufficient. The model is particularly relevant as systems that store wind and solar energy in batteries become more and more competitive. Switching remote islands to green, sustainable electricity is “a groundbreaking scenario,” said Mantas of Greece’s Eunice Energy. “We hope that the Tilos project will be replicated in many more islands,” he said.